Mobile World Congress was big and busy, as always. There were lots of interesting demos, technologies and much more. While I was only able to look at a few demos, here is my summary of the small cells related info that I managed to see or came across on social media. 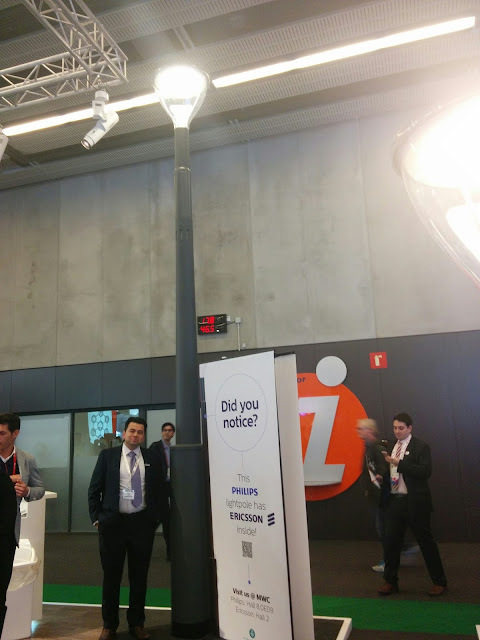 Ericsson and Philips have been working together for a while so its no surprise they were showing their new connected street lighting model. You can see this from my picture above. 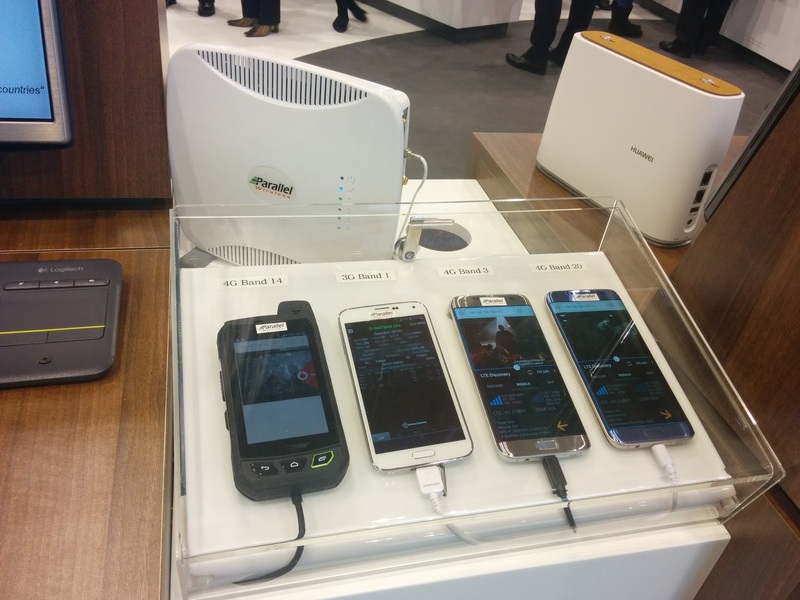 Sprint has already mentioned earlier that they will be rolling out more small cells and they were conveying the same message at MWC. Their rival T-Mobile says that they have 1000 small cells right now but will have 5/6000 by the end of the year. IP Access had a nice booth and it was good to see that their CEO Malcolm Gordon and CTO Nick Johnson both managed to get their message across that 2017 will probably be a big year for Small Cells. Vodafone introduced the "CrowdCell" concept last year, this year they continued to build on that story. The CrowdCell uses macro for backhaul. I generally refer to this as In-band backhaul (IBBH) and have written about this here. While they have already shown Indoor CrowdCell and In-car CrowdCell before, this year they were showing the Flying CrowdCell. You can see a video of that here (in Spanish) and a non-flying version here. This is slightly similar to the Airmast concept by EE. 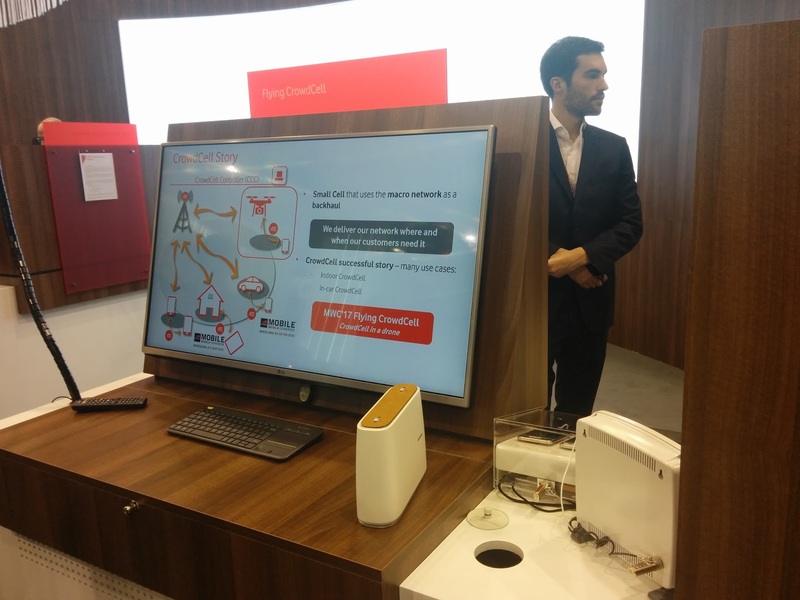 Hidden in a corner at the Vodafone booth was a pre-commercial quad band femto by Parallel Wireless. If you look at the form factor, its no different than a single band femto from couple of years back. 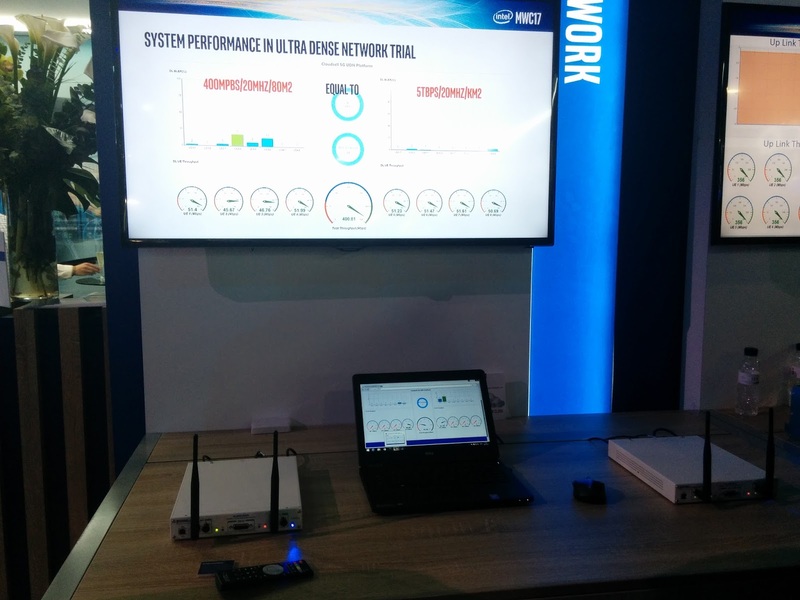 Parallel Wireless also had a presence on many of their partners booths (picture above from KMW booth). TMN magazine has a feature on them and I embed their video below. 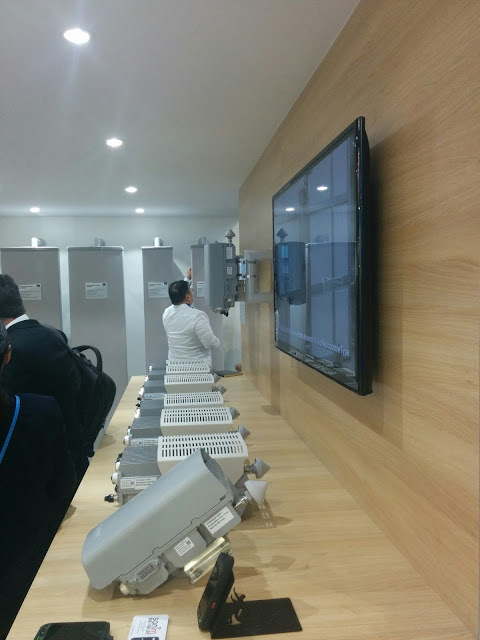 China Unicom is deploying 500 Radio Dots from Ericsson in Beijing. 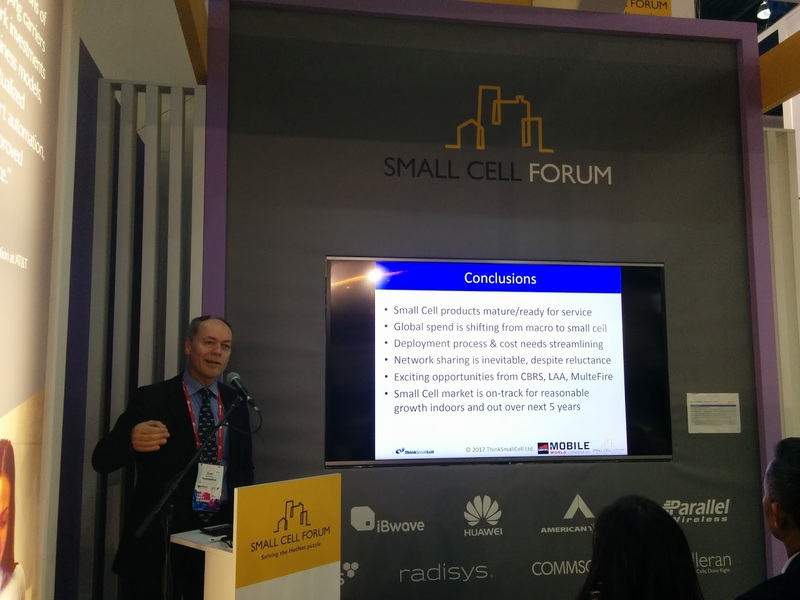 Acceleran was showing small cells on 3.5GHz CBRS band. The Indian mobile operator Reliance Jio, which recently set a record for fastest 100 million subscribers (in 170 days), will be deploying Airspan small cells. This should be a massive project for Airspan. 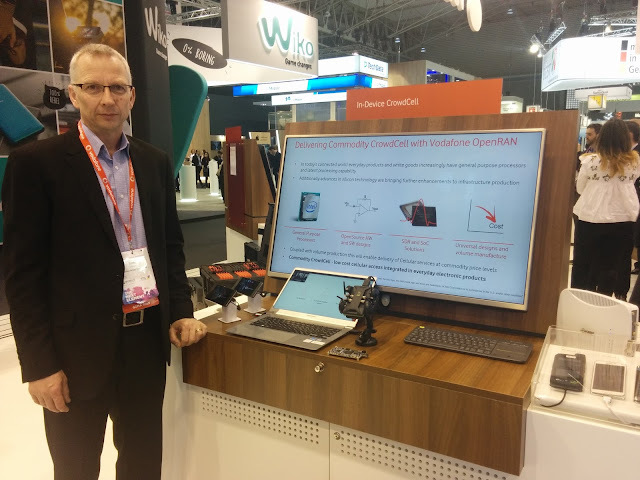 Finally, there were quite a few 5G conceptual demo's. The picture above is from Intel stand. Due to 5G not yet defined, people were either using 28GHz or 60GHz. Regardless of what they were demonstrating, they would claim it to be 5G. Apologies to other vendors I have missed. There were also some good presentations at the Small Cell Forum networking area. The link for them is below and I will also be sharing some more of them in the coming weeks.